IRT’s Westside Experiment has joined Improbable Stage Company as they lead students through an incredible development process resulting in a show at IRT! The dictionary tells us that “normal” is- 1. of, relating to, or characterized by average intelligence or development. 2. traditional, upstanding, doesn’t deviate from the norm. Not very inspiring. 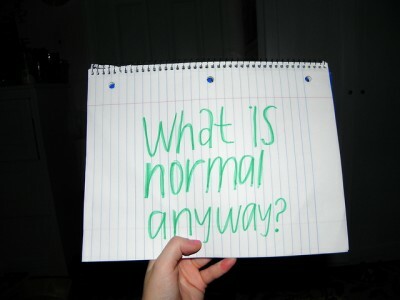 So, is it important to be “normal”? How do we collectively determine what “normal” even is? This devised theater piece created by the students of IRT’s Westside Experiment and Improbable Stage Company explores the underlying concepts behind the word “normal”- what it is, how do we as a society or individuals determine it, how “normal” changes from culture to culture and throughout time and, ultimately, whether or not “normal” even exists? – Running time 1 hour. Since 2007, IRT Theater has made a mission of hosting radically affordable, full-immersion development residencies for emerging and established artists. An offshoot of the IRT 3B Development Series, the IRT Westside Experiment will offer students the skills to create original devised theater in collaboration with a working theater company in residency at IRT, Improbable Stage Company. The Improbable Stage Company is a not-for-profit, multigenerational, theatre company based in New York City. Our members are an impassioned ensemble that is dedicated to creating intriguing theatrical work, to supporting and nurturing seasoned and fledgling performers, and to inspiring and educating future generations of theatre artists. Stacy A. Donovan: An artist and teacher, Stacy has spent her career collaborating with artists of all generations, in many different areas of the country, professional and non-professional, & it is this collaboration that inspired the Improbable Stage Company, of which she is the founder and artistic director. In 2012, Stacy and her company were selected to plan and implement the theatre curriculum for a new public high school in Union Square, The Harvest School. Improbable Stage’s original works BOX (2010) and Listen . . . (2011) were developed in residency at IRT Theater. Stacy holds a BA in Theatre and an MA in English with a concentration in Dramatic Literature and Shakespeare, both from Columbia University. Julia Hansen Julia has appeared in BOX (Ensemble) Listen… (Ensemble) and Shrewd (Kate) with Improbable Stage Company. She is a graduate of Skidmore College with a Bachelor of Science in Theater. Skidmore credits include: Sweeney Todd: The Demon Barber of Fleet Street (Mrs. Lovett), A Midsummer Night’s Dream (Helena), Romeo and Juliet (Nurse), Pizza Man (Alice), Mystery Musical(Susan), Nunky Gruel (Eliza), and The Women (Mrs. Morehead). She has also trained in London at the British American Drama Academy in Shakespeare and High Comedy. Lauren Lasorda (Ensemble) Lauren is a recent graduate of University of San Francisco with degrees in Performing Arts/Social Justice and Kinesiology. Some of her credits include: A Midsummer Night’s Dream (Titania), The Laramie Project (multiple roles), The Learned Ladies (Henriette). Lauren has performed with [detour dance] and WE Players in San Francisco and has worked with Erika Shuch, Natalie Greene, and Christy Fsunch. She spent the summer of 2009 in Peru teaching curriculum through movement in the Miguel Pro School. She performed in and created new choreography for the New York City production of BOX, Listen… and Shrewd. Most recently, Lauren has taken a step back from performing and has worked on creating modern dance pieces. In addition, she served as the choreographer for The Wild Party and Spring Awakening, also in San Francisco.